To Quilt is Human, to Finish is Divine! 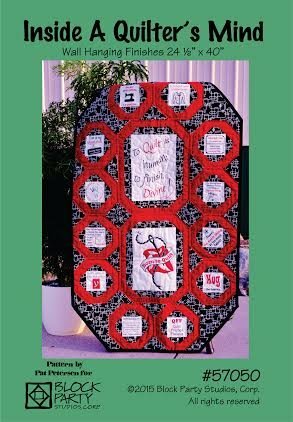 Celebrate the love of quilting with our "Inside a Quilter's Mind" panel. 12 - 3.5" squares and 2 - 7" x 10.5" rectangles. Printed in black and red ink on white or natural 100% Kona Cotton. Pattern makes wall hanging measuring 24.5" x 40".